Sure we covered the cool robotic mowers from Husqvarna before, whether they be solar-powered or non. Today, we would like to present you with the Automower 260 ACX. What makes this guy unique? First of all, it will text you if there is problems. You have no idea how relieved I am to hear that. After all, most Roombas or other independently automated vacuum cleaners are indoors, and it is easy to check up on them if there are problems. But an automated lawn-mower? I don’t know if I can really trust that to operate without my supervision. I may be sipping lemonade in my air-conditioned home while the Automower 260 ACX is supposedly doing the work, but for all I know, it could be running over my neighbor’s cat. 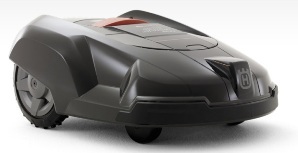 In addition to this texting feature, the Automower 260 ACX can work “as a guard dog against moles, slugs, and other yard destroying pests”. I’m not certain how it does that part of it, as that was all my source had to say about it. My source also didn’t have a release date or price on this texting Automower 260 ACX. I believe the last time I quoted a price on a Husqvarna automower, it was about $2,000. Let’s just assume a little more here.